Scientists have found a near-complete skull of a large Homo naledi individual in the second chamber they have researched at the Rising Star cave system. Credit Hawks et al (2017) eLife under CC BY 4.0. The early human species Homo naledi lived much more recently than many scientists had suspected, according to research released today. Researchers, who found the first fossils of the species in 2013 in a South African cave, have now dated the remains as between 236,000 and 335,000 years old. This means the species, which has a mixture of primitive and more modern anatomical features, could have been living at the same time as our own species Homo sapiens. This younger age, published in the journal eLife, has a number of implications for palaeoanthropology, according to the Museum's human origins expert Prof Chris Stringer. 'This is astonishingly young for a species that still displays primitive characteristics found in fossils about two million years old,' he says. If the new date is correct, then it means Homo naledi was on the African continent with a number of other, bigger brained, early human species. What were its origins, how did it survive, and have we missed other clues of its existence? Fossil bones of Homo naledi discovered in the first cave and announced in 2015. Credit Berger et al (2015) eLife under CC BY 4.0. Early humans arose in Africa between two and three million years ago, but tracing the history and evolution of the various Homo species that have existed since then is tricky as the fossil record is patchy. Although Homo sapiens are the only surviving members of the group, there was no simple progression towards modern humans, and many different human types and body plans co-existed at different times. The primitive characteristics of Homo naledi include its small brain size, curved fingers, and the form of its shoulder, trunk and hips. But it also has wrists, hands, legs and feet that look more like those of Neanderthals and modern humans, and small teeth. The teeth and lower body skeleton suggest Homo naledi may have had a lifestyle and diet similar to other hunter-gatherers, such as late Homo heidelbergensis/rhodesiensis and early Homo sapiens, that were present elsewhere in Africa at the same time. 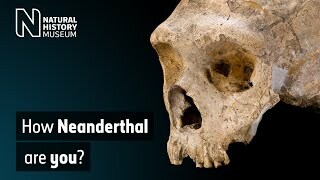 How then did H. naledi survive against the bigger-brained competition? Although we do have another example of a small-brained species surviving until relatively recently - the diminutive Homo floresiensis in Indonesia - that probably survived as it was isolated on an island. Casts of the jaw and hand of Homo naledi. The hand has a very human shape, especially if you look at the wrist and palm. But the curved finger bones and strong thumb set it apart from ours. The new research, led by Lee Berger of the University of Witwatersrand, also details the discovery of a second chamber of H. naledi fossils, found within the same Rising Star cave system in South Africa. This will increase the debate about how the remains arrived deep within the caves, well beyond any natural light. 'The authors of the Homo naledi studies favour the idea of intentional and repeated disposals of dead bodies by other members of the species,' says Prof Stringer. 'Many experts, including me, consider such complex behaviour unlikely for a creature with a brain size close to that of a gorilla, particularly when a requirement for the controlled use of fire, for lighting, probably has to be added in. The geographical location of the Rising Star cave in the Cradle of Humankind UNESCO World Heritage Site in South Africa. Credit Hawks et al (2017) eLife under CC BY 4.0. New discoveries such as Homo naledi compel palaeontologists to look through earlier fossil and archaeological finds to see if they need to be interpreted in new ways. For example, fossil fragments from elsewhere in Africa that have been attributed to other species might need to be reassigned to H. naledi. 'Although the Homo naledi fossils have not so far been found with any stone tools, it seems highly likely that its handiwork is present in the archaeological record of southern Africa, but currently attributed to other human species,' says Prof Stringer.